Aton reports the final Rodruin Phase 1 RC drilling results, including 70m @ 1.16 g/t Au from 11m depth, and 11m @ 5.01 g/t Au and 2.27% Zn in primary sulphide mineralisation | Aton Resources Inc.
Vancouver, January 29, 2019: Aton Resources Inc. (AAN: TSX-V) (“Aton” or the “Company”) is pleased to update investors on the assay results from the final 14 holes of the Phase 1 reverse circulation percussion (“RC”) drilling programme at its advanced Rodruin prospect, within the Company’s 100% owned Abu Marawat Concession (“Abu Marawat” or the “Concession”), located in the Eastern Desert of Egypt. 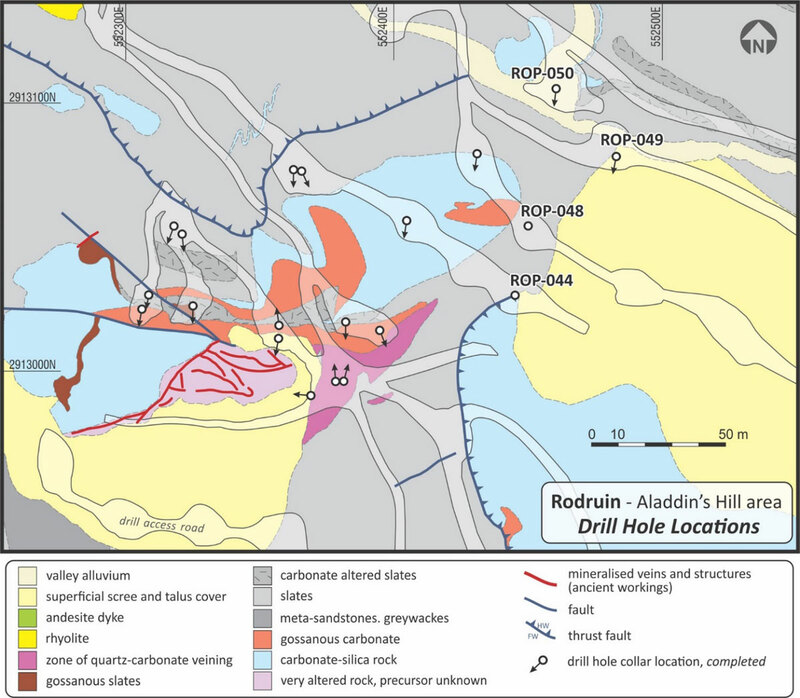 The Phase 1 RC programme at Rodruin has successfully identified widespread gold (±silver-zinc) mineralisation over the extent of the South Ridge, including significant thicknesses of easily mineable oxides outcropping from surface, as well as a wide zone of deeper sulphide mineralisation, believed to be the primary equivalent of the near-surface oxide mineralisation, which is completely open in all directions. Drilling has confirmed that high grade zones are locally present within both the near-surface oxide and the primary sulphide mineralisation. Assay results from the final 14 drill holes, ROP-037 to ROP-050, of the Phase 1 RC drilling programme at Rodruin are now available, see Table 1 for hole collar details. Full details of the mineralised intervals from these holes are provided in Appendix A. Holes ROP-037 to ROP-042 were all drilled to test the GFZ, some 500m southeast of the high grade mineralisation at Aladdin’s Hill (36m @ 12.47 g/t Au, see news release dated October 1, 2018); hole ROP-043 was drilled to the northeast from the Central Valley (“CVZ”); holes ROP-044 and ROP-048 to ROP-050 were drilled to the northeast of Aladdin’s Hill to test for both near surface and deeper sulphide mineralisation; and holes ROP-045 to ROP-047 were drilled on the CBZ (see Figure 1). 4 holes were completed northeast of the main ancient underground workings at Aladdin’s Hill (see Figures 1 and 2). 2 shallow vertical holes, ROP-044 and ROP-048 were completed primarily to test the surface zone of Au and high grade Zn oxide mineralisation identified in hole ROP-017 (34m @ 1.39 g/t Au and 8.86% Zn from surface, see news release dated November 12, 2018) and in surface channel sample profile ROC-009 (65.3m @ 2.84 g/t Au and 5.26% Zn, see new release dated September 24, 2018). Holes ROP-049 and ROP-050 were drilled on a southerly azimuth to test for both near-surface and deeper sulphide mineralisation. Hole ROP-049 intersected lower grade mineralisation in weathered carbonates from surface (25m @ 0.47 g/t and 0.66% Zn), as well as a narrow zone of contact-hosted mineralisation (3m @ 5.71 g/t Au, from 37m). Hole ROP-050 also intersected this zone of low grade near-surface mineralisation in weathered carbonates (16m @ 0.48 g/t and 0.98% Zn, from 9m). It also and most significantly intersected a wide zone of sulphide mineralisation at depth (61m @ 1.55 g/t Au, 8.9 g/t Ag and 0.86% Zn, from 11m), including a high grade interval of 11m @ 5.01 g/t Au, 25.8 g/t Ag, 0.20% Cu and 2.27% Zn, from 158m. This interval of sulphide mineralisation is very significant in that it extends the sulphide mineralisation intersected in hole ROP-017 (55m @ 1.23 g/t Au, 10.4 g/t Ag, and 1.40% Zn, see new release dated November 12, 2018). A further 3 holes ROP-045 to ROP-047 were collared on a second drill pad on the CBZ, on the northern flank of the South Ridge (see Figures 1 and 3). 2 angled holes were drilled towards the east and south, as well as a single vertical hole. Drilling of the CBZ from above this pad previously returned good intersections including 40m @ 1.30 g/t Au and 13.5 g/t Ag from surface, and 11m @ 5.20 g/t Au and 23.0 g/t Ag from 59m (ROP-032), 31m @ 2.45 g/t Au and 12.5 g/t Ag from 2m depth (hole ROP-034) and 34m @ 2.00 g/t Au from 10m (hole ROP-033, see news release dated January 3, 2019). All 3 holes hit gold mineralisation with hole ROP-047, drilled towards the east, returning a wide mineralised intersection of 70m @ 1.16 g/t Au and 8.3 g/t Ag from 11m depth, in weathered and sometimes gossanous carbonates. This hole unfortunately had to be prematurely terminated in mineralisation due to the hole collapsing in unstable ground from about 50m downhole depth onwards. Hole ROP-045, drilled towards the south, intersected 18m @ 1.74 g/t Au, 9.2 g/t Ag and 1.08% Zn from 17m depth as well as a lower interval of 11m @ 0.96 g/t Au and 9.1 g/t Ag from 52m, also in weathered and sometimes gossanous carbonates. Ancient underground workings were intersected in this hole between 25-28m, with no sample recovery. Zero grade was assigned to the mined interval, thus clearly underestimating the pre-mining grade of the overall mineralised intersection. Vertical hole ROP-046 intersected 33m @ 0.92g/t Au and 7.1 g/t Ag from 32m depth, after passing from unmineralised metasediments into weathered and gossanous carbonates. The GFZ is located approximately 500m east-southeast of the main workings at Aladdin’s Hill, and is expressed at surface as a series of dark chocolate brown gossanous carbonates, again with abundant ancient workings. 6 holes ROP-037 to ROP-042 were completed from 2 drill pads at the GFZ (see Figures 1 and 4), with one additional hole, ROP-043, drilled under the North Ridge from the Central Valley (see Figures 1 and 3), testing a possible strike continuation of the GFZ. 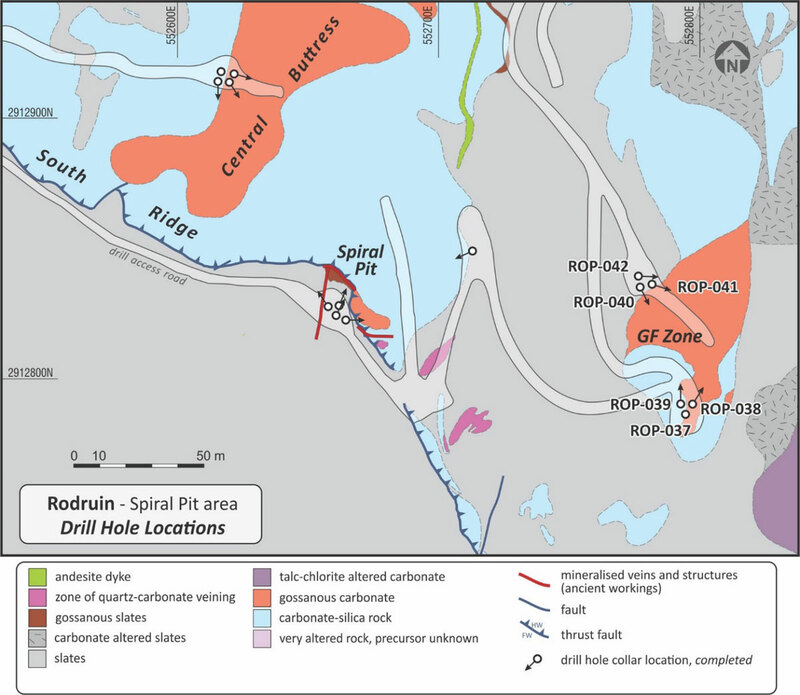 3 holes were completed from the upper, southernmost pad at the GFZ, holes ROP-037 to ROP-039, of which ROP-037 was a re-drill of hole ROP-036 (see news release dated January 3, 2019). All 3 holes intersected good thicknesses of gossanous carbonate hosted mineralisation from surface, returning mineralised intervals of 29m @ 1.59 g/t Au (composite intersection from holes ROP-036 and ROP-037, see Appendix A), 35m @ 0.64 g/t Au (hole ROP-038) and 40m @ 0.74 g/t Au (hole ROP-039). A further 3 holes were drilled from a lower pad. Hole ROP-041 was abandoned after intersecting ancient workings very near to surface and was not sampled. All 3 holes again intersected gossan-hosted mineralisation from surface, returning mineralised intervals of 29m @ 0.74 g/t Au (hole ROP-040), and 35m @ 0.83 g/t Au (hole ROP-042). Hole ROP-043 was drilled from the Central Valley about 150m to the north and returned a mineralised interval of 25m @ 0.73 g/t Au from 3m depth, in weathered carbonates, beneath ancient workings. It appears likely that the mineralisation intersected in this hole represents a northerly extension of the GFZ. The final batch drilling of results from the Phase 1 RC programme at Rodruin has again continued to confirm the presence of outcropping gold mineralisation in weathered and gossanous carbonates at surface or very near to surface over a wide area of the South Ridge at Rodruin, as well as indicating the presence of primary sulphide mineralisation at depth. 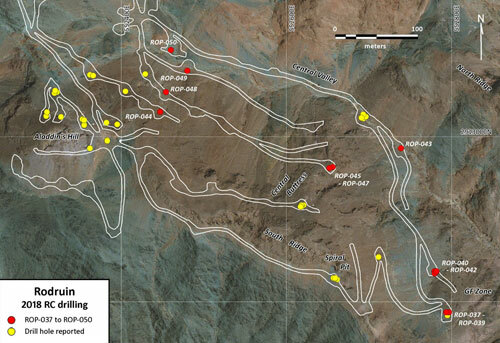 Once again gold mineralisation was returned from all holes that reached their planned targets. Aton is particularly encouraged by the deeper gold-polymetallic mineralisation hosted within altered dolomitic carbonate rocks intersected in hole ROP-050. This intersection expands the zone of sulphide mineralisation previously identified in hole ROP-017. This mineralisation strongly appears to be the primary equivalent of the gossan-hosted mineralisation seen over large extents of the South Ridge. The identification of a deep primary equivalent of the widespread surface mineralisation provides strong support to the Company’s interpretation that Rodruin has the potential to host a large gold deposit. It is also noted that the deep sulphide mineralisation in hole ROP-050 is effectively blind, occurring beneath completely unmineralised metasediments (greywackes, slates), and is open in all directions. This sulphide gold-polymetallic mineralisation is located vertically beneath holes ROP-044 and ROP-048 which were terminated in the barren metasediments and not drilled deep enough to intersect the sulphide mineralisation. Hole ROP-049 was also terminated prematurely in barren metasediments, and re-interpretation of this structurally complex zone, which is affected by faulting, low angle thrusting, and folding is being undertaken. It will probably be necessary to deepen some of these holes during the upcoming Phase 2 drilling programme, and expanding the sulphide mineralisation zone will be a major focus in Phase 2. Hole ROP-048 also expanded the surface zone of gold and high grade zinc oxide mineralisation previously identified in hole ROP-017 and in surface channel sample profile ROC-009 (see news release dated November 12, 2018), and further delineation of this zone will also be a focus of the Phase 2 RC programme, notably to the southeast of hole ROP-048 where outcrop is totally obscured by cover (see Figure 2). It is also noted that this zone bears similarities to a zone of similar gold and high grade zinc oxide surface mineralisation at Hamama East (see news release dated May 3, 2018). Holes ROP-045 to ROP-047 confirmed the presence of significant further widths of near surface mineralisation at the CBZ, previously drilled in holes ROP-031 to ROP-034 (see news release dated January 3, 2019). The intersection of 70m @ 1.16 g/t Au from only 11m depth in hole ROP-047 is particularly encouraging in that it confirms a broad zone of continuous mineralisation effectively outcropping from surface at the CBZ, and is additive to similar broad zones of mineralisation identified from surface in holes ROP-031 to ROP-034. Drilling at the GFZ was also most encouraging with consistent gold mineralisation being identified from surface, albeit it a lower grade than from other zones. This surface mineralisation identified at the CBZ and the GFZ, as well as that previously identified in the Aladdin’s Hill and Spiral Pit (“SPZ”) areas would be readily amenable to open pit mining and extraction at potentially very low stripping ratios. Aton is very pleased with the results from the Phase 1 RC drilling programme at Rodruin in that the drilling has achieved its primary objective of confirming the presence of gold mineralised zones outcropping at surface over a significant extent of the South Ridge, and their primary equivalent at depth. 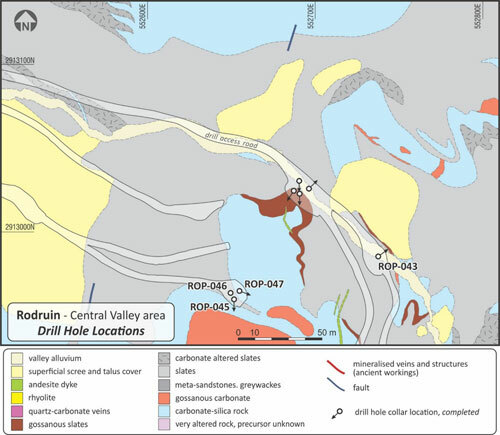 The drilling has continued to confirm the structural complexity of the area; that the gold mineralisation is largely, but not exclusively, hosted within altered, dolomitic and apparently sedimentary carbonates, occurring within a metasedimentary package; and that the mineralisation is typically strongly oxidised to gossans in the near-surface environment, and has a polymetallic assemblage with subsidiary Ag, Zn, and sometimes Cu and Pb. The bulk of the gold mineralisation at Rodruin bears very broad similarities to that at the Company’s Hamama project, but has a notably higher overall Au tenor, and a structurally controlled component to the mineralisation that is not typically seen at Hamama. Aton is also pleased that the drilling continues to confirm the Company’s early interpretation that the mineralisation at Rodruin also includes higher grade free gold-bearing zones (see news release dated December 14, 2017). The high grade mineralisation at Aladdin’s Hill is associated with east-west trending structural controls, and is hosted within a series of strongly phyllic altered rocks interpreted to be altered and oxidised metasediments. Similar structural analogues have been interpreted at the SPZ, and possibly also on the CBZ. While the initial results from hole ROP-003 at Aladdin’s Hill (36m @ 12.47 g/t Au from 5m, see news release dated October 1, 2018) were exceptional, the subsequent drilling has continued to identify high grade near-surface zones, grading in excess of 5 g/t Au at both the CBZ and the SPZ, and hole ROP-050 has now also confirmed the presence of high grade zones in the primary sulphide mineralisation. Aton is now making preparations for the commencement of the Phase 2 drilling programme at Rodruin. Phase 2 will continue to follow up on Phase 1, and will additionally focus on previously untested areas of the South Ridge, such as those areas under superficial cover, as well as attempting to delineate and expand the zone of primary mineralisation identified in holes ROP-017 and ROP-050. It is also planned that a drill access road will be constructed around to the northern side of the hitherto untested North Ridge, with the aim of drill testing a zone of high grade ancient workings on quartz-sulphide veins that yielded samples assaying up to 321 g/t Au (see news release dated February 6, 2018), as well as zones of argillic hydrothermal alteration, associated with Cu, Pb and Te-bearing veins. The Rodruin prospect was discovered in December 2017 by Aton geologists (see news release dated December 14, 2017), and is located approximately 18km east of the Company’s Hamama West mineral deposit. Field mapping and sampling has indicated the presence of ancient mine workings and extensive gold mineralisation over an area of at least 700m x 400m at surface. Mineralisation is associated with a sequence of carbonate and metasedimentary slate and greywacke rock types. Abundant visible gold has been identified in hand specimens from surface outcrops, and ancient dumps and underground workings, with individual selective grab samples assaying up to 321 g/t Au (see news releases dated February 6, 2018, March 5, 2018 and April 16, 2018). Drilling has now confirmed the presence of high grade gold mineralisation at Aladdin’s Hill with individual samples returning assays of up to 221 g/t Au over metre intervals (see news release dated October 1, 2018). Drilling results released to date from Rodruin include intersections of 36m @ 12.47 g/t Au from 5m (hole ROP-003 at Aladdin’s Hill, see news release dated October 1, 2018), 163m @ 0.90 g/t Au from surface (hole ROP-017 northeast of Aladdin’s Hill, see news release dated November 12, 2018), 20m @ 5.36 g/t Au (hole ROP-029 at the Spiral Pit, see news release dated December 10, 2018), and 40m @ 1.30 g/t Au and 13.5 g/t Ag from surface, and 11m @ 5.20 g/t Au and 23.0 g/t Ag from 59m (hole ROP-32 at the CBZ, see news release dated January 3, 2019). The selected c. 250-500g drill and channel samples were shipped to ALS Minerals at Rosia Montana, Romania for analysis. Samples were analysed for gold by fire assay with an atomic absorption spectroscopy (“AAS”) finish (analytical code Au-AA23); and silver, copper and zinc with an aqua regia digest followed by an AAS finish (analytical code AA45). High grade gold samples (>10 g/t Au) were re-analysed using analytical code Au-AA25 (also fire assay with an AAS finish). High grade Ag and base metal samples (Ag >100 g/t, and Cu and Zn >10,000ppm or >1%) were re-analysed using the ore grade technique AA46 (also an aqua regia digest followed by an AAS finish). collared c. 1.5m from ROP-036. and ROP-037 (samples between 15-29m).